Most consumers looking at the Samsung Level Box might be shocked by the $200 sticker price attached to it, which seems obnoxiously expensive considering its size. For just about the same price, you can get some beefier Bluetooth speaker systems that put to shame the Level Box’s audio output. Well, it seems as though Samsung has an alternative for those who don’t think that the Level Box’s price is reasonable. Enter the Samsung Level Box Mini, which some folks might suspect as being nothing more than a scaled back version. However, is that really the case here? There’s no denying that the Samsung Level Box Mini shares a similar design language as its sibling, but in being true to its name, it’s in a more confined packaging that before. In terms of speaker designs, there’s nothing too out of the ordinary from this rectangular shaped thing. Still constructed out of plastic, one that has a sturdy feel and a fair amount of substance behind it, the entire thing feels quite solid in the hand. Naturally, the accompanying weight helps in giving it that substantial feel, but it would’ve been more compelling for Samsung to give it a more modern looking design. Along the top surface, we have recessed buttons for pause/play, volume down, volume up, and power – while not too far away, we have the distinct NFC logo to make pairing a breeze with it. Wrapping around the front and behind the tough plastic grill are the speakers, which produce a reasonable amount of power. In our experience, its volume is enough to fill small spaces – so don’t expect to throw a party relying on this thing. At the loudest volume, it’s able to maintain a tolerable level without sounding strained, but it lacks the crisp tones to make all audio ranges reverberate. Rounding things out, the rear is home to its microUSB port to charge its internal battery, a dedicated Bluetooth button, and an auxiliary jack. Costing half as less as its sibling, the $99.99 price of the Samsung Level Box Mini won’t be too draining on the pockets, but in all fairness, we continue to find it on the pricier side – more so when pitted against some other comparably sized systems. Well for John V, an Apple Logo will immediately earn that extra 2 points. Speaker review with no audio quality description. I have the JBL charge and Level Box. I like the output of Level Box.. I do like Level audio characteric. 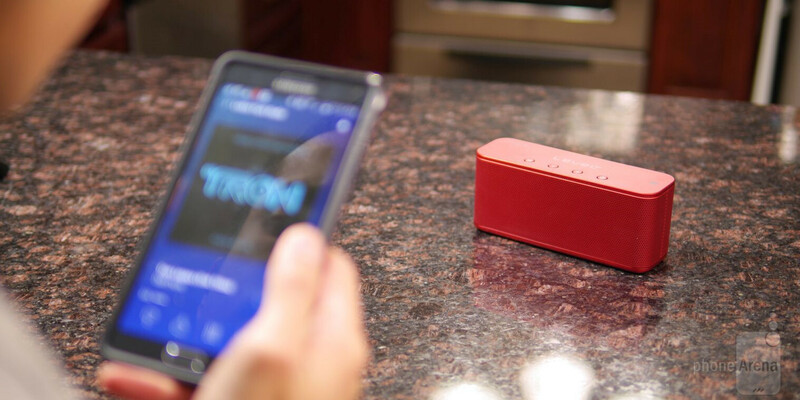 Its trying to mimicking high end audio with transparent sound while creative roar is a 100% mini boom box. I would appreciate if speaker review mention these type of information as good audio is subjective and very personal.